The best cat collar is easy to fit correctly and comes off when caught on something. Until recently, I didn't think there was a best cat collar. They all seemed pretty much the same to me. The designs on some were cuter than others (a couple of my cats had Laurel Burch collars until they lost them). But they all had clumsy breakaway clasps and were hard to resize so they fit perfectly. On my cats, they never fit perfectly. The woods behind my condo are littered with cat collars, and most of them belonged to my cats. I kept a supply on hand, although I didn't think any of them even came close to being the best cat collar. Then my worst nightmare came true. My outside cat's jaw got caught under her collar. She must have been so scared and in so much pain. And getting that collar off wasn't easy for me or for her. That's when my very determined search for the best cat collar began. Clicking on the links will take you to Amazon. The Beastie Bands cat collar is made of light, stretchy neoprene, so if it gets caught on something, the cat can slip out. The Velcro closure allows for a perfect and secure fit. And it's so light, the cat barely knows it's there. An added plus: There's no annoying bell to break off. 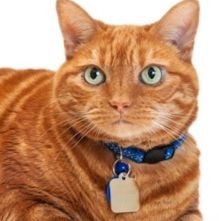 My outside cat, Ginger, has this collar and loves it as much as any cat would love any collar. The buckle of Coastal Pet Products' Elastacat Collar pushes through the fabric, allowing for the perfect fit. Just make sure the buckle goes through the fabric instead of slipping off to the side. The fabric is reflective, stretchy, polyester, so if the collar gets caught on something, the cat will be able to slip out. It's so light and comfortable, even Muffitt, who has very sensitive skin, barely knows it's there. All of my cats had GoTags embroidered collars until they got lost in the woods. Like all collars with snap closures, they're difficult to fit correctly, and a very determined cat can get them off. I recommend these collars because the embroidery is easier to read than tags, so just about anybody can see the cat's name and your phone number. My cats have no interest at all in birds, but the CatBib gets great reviews on Amazon. Made of thin neoprene backed with nylon, it interferes with a cat's timing during a bird strike. Although it makes catching birds almost impossible, it doesn't interfere with running, jumping, climbing and all the other things cats do. If one or two fingers fit between the collar and the cat, it's fitted correctly. If the collar's too loose, a leg could get caught in the collar while the cat is scratching his neck trying to get it off. And the cat's jaw could get caught under a collar that's too loose. Check the collar often. The size of your cats' necks can change as they shed and add their summer or winter coats. Your cats should wear collars, especially if they go out. Collars tell people who see the cats outside that they have a home and a human who cares about them. But a collar is no substitute for a microchip. Collars get lost. But the chip is there forever, even if it migrates to another part of the cat's body. If your cat gets lost, that chip could be his ticket home. One more caution: If you walk your cat on a leash, use a harness. Breakaway collars are designed to pull apart under pressure. The collars that don't close with plastic buckles would probably stay together. But pulling on the collar would be uncomfortable and could injure the cat.